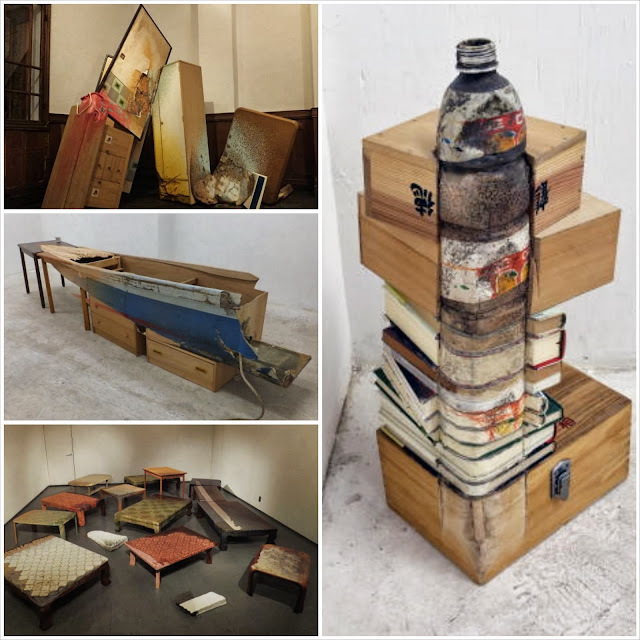 Fumiaki Aono has exhibited at venues including the Rias Ark Museum of Art and the Miyagi Museum of Art and in the 1990s he began working with objects washed up on the coastline and other fragments of broken items, using them as the base for creating artworks, making additions in a process he considers to be mending or restoring. How sadly ironic then that Aono's greatest creative challenge arrived on his doorstep when his local area was impacted by an avalanche of debris produced by the 2011 Great East Japan Earthquake and tsunami. He subsequently worked with the wreckage, including items from his own neighborhood, the homes of relatives, and familiar places, adopting a variety of approaches in an attempt to add in what is missing from these items and seek out the form that the recycled objects should take. His work appears in the second and one of the largest of Japan's art festivals: the Aichi Triennale which ends October 27.